Audi pro­vide fac­tory sup­port to Abt Sport­sline in the FIA For­mula E Cham­pi­onship, The team com­peted under the title of Audi Sport Abt For­mula E Team in the in­au­gural 2014-15 For­mula E sea­son. On 13 Feb­ru­ary 2014 the team an­nounced its dri­ver line up as Daniel Abtand World En­durance Cham­pi­onship dri­ver Lucas di Grassi. Audi has been linked to For­mula One in re­cent years but has al­ways re­sisted due to the com­pany’s opin­ion that it is not rel­e­vant to road cars, but hy­brid power unit tech­nol­ogy has been adopted into the sport, sway­ing the com­pany’s view and en­cour­ag­ing re­search into the pro­gram by for­mer Fer­rari team prin­ci­pal Ste­fano Domeni­cali. The Audi em­blem is four over­lap­ping rings that rep­re­sent the four mar­ques of Auto Union. The Audi em­blem sym­bol­ises the amal­ga­ma­tion of Audi with DKW, Horch and Wan­derer: the first ring from the left rep­re­sents Audi, the sec­ond rep­re­sents DKW, third is Horch, and the fourth and last ring Wanderer. The de­sign is pop­u­larly be­lieved to have been the idea of Klaus von Oertzen, the di­rec­tor of sales at Wan­derer – when Berlin was cho­sen as the host city for the 1936 Sum­mer Olympics and that a form of the Olympic logo sym­bol­ized the newly es­tab­lished Auto Union’s de­sire to succeed. Some­what iron­i­cally, the In­ter­na­tional Olympic Com­mit­teelater sued Audi in the In­ter­na­tional Trade­mark Court in 1995, where they lost. The orig­i­nal “Audi” script, with the dis­tinc­tive slanted tails on the “A” and “d” was cre­ated for the his­toric Audi com­pany in 1920 by the fa­mous graphic de­signer Lu­cian Bern­hard, and was res­ur­rected when Volk­swa­gen re­vived the brand in 1965. Fol­low­ing the demise of NSU in 1977, less promi­nence was given to the four rings, in pref­er­ence to the “Audi” script en­cased within a black (later red) el­lipse, and was com­monly dis­played next to the Volk­swa­gen roundel when the two brands shared a dealer net­work under the V.A.G ban­ner. The el­lipse (known as the Audi Oval) was phased out after 1994, when Audi formed its own in­de­pen­dent dealer net­work, and promi­nence was given back to the four rings – at the same time Audi Sans (a de­riv­a­tive of Univers) was adopted as the font for all mar­ket­ing ma­te­ri­als, cor­po­rate com­mu­ni­ca­tions and was also used in the ve­hi­cles them­selves. As part of Audi’s cen­ten­nial cel­e­bra­tion in 2009, the com­pany up­dated the logo, chang­ing the font to left-aligned Audi Type, and al­ter­ing the shad­ing for the over­lap­ping rings. The re­vised logo was de­signed by Rayan Abdullah. Audi de­vel­oped a Cor­po­rate Sound con­cept, with Audi Sound Stu­dio de­signed for pro­duc­ing the Cor­po­rate Sound. The Cor­po­rate Sound pro­ject began with sound agency Klangerfinder GmbH & Co KG and s12 GmbH. Audio sam­ples were cre­ated in Klangerfinder’s sound stu­dio in Stuttgart, be­com­ing part of Audi Sound Stu­dio col­lec­tion. Other Audi Sound Stu­dio com­po­nents in­clude The Brand Music Pool, The Brand Voice. Audi also de­vel­oped Sound Brand­ing Toolkit in­clud­ing cer­tain in­stru­ments, sound themes, rhythm and car sounds which all are sup­posed to re­flect the AUDI sound character. It was first used in Eng­lish-lan­guage ad­ver­tis­ing after Sir John Hegarty of the Bar­tle Bogle Hegarty ad­ver­tis­ing agency vis­ited the Audi fac­tory in 1982. In the orig­i­nal British tele­vi­sion com­mer­cials, the phrase was voiced by Ge­of­frey Palmer. After its re­peated use in ad­ver­tis­ing cam­paigns, the phrase found its way into pop­u­lar cul­ture, in­clud­ing the British com­edy Only Fools and Horses, the U2 song “Zooropa” and the Blur song “Park­life“. Sim­i­lar-sound­ing phrases have also been used, in­clud­ing as the punch­line for a joke in the movie Lock, Stock, and Two Smok­ing Bar­rels and in the British TV se­ries Peep Show. 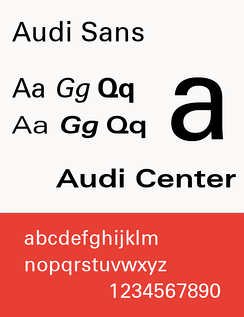 Audi Sans (based on Univers Ex­tended) was orig­i­nally cre­ated in 1997 by Ole Schäfer for MetaDe­sign. MetaDe­sign was later com­mis­sioned for a new cor­po­rate type­face called Audi Type, de­signed by Paul van der Laan and Pieter van Ros­malen of Bold Mon­day. 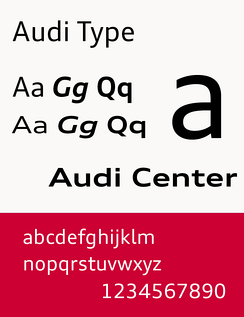 The font began to ap­pear in Audi’s 2009 prod­ucts and mar­ket­ing materials. Audi is a strong part­ner of dif­fer­ent kinds of sports. In foot­ball, long part­ner­ships exist be­tween Audi and do­mes­tic clubs in­clud­ing Bay­ern Mu­nich, Ham­burger SV, 1. FC Nürn­berg, Hertha BSC, and Borus­sia Mönchenglad­bach and in­ter­na­tional clubs in­clud­ing Chelsea, Real Madrid, FC Barcelona, A.C. Milan, AFC Ajax and Per­spo­lis. Audi also spon­sors win­ter sports: The Audi FIS Alpine Ski World Cup is named after the com­pany. Ad­di­tion­ally, Audi sup­ports the Ger­man Ski As­so­ci­a­tion (DSV) as well as the alpine ski­ing na­tional teams of Switzer­land, Swe­den, Fin­land, France, Liecht­en­stein, Italy, Aus­tria and the U.S. For al­most two decades, Audi fos­ters golf sport: for ex­am­ple with the Audi quat­tro Cup and the Hy­poVere­ins­bank Ladies Ger­man Open pre­sented by Audi. In sail­ing, Audi is en­gaged in the Med­cup re­gatta and sup­ports the team Luna Rossa dur­ing the Louis Vuit­ton Pa­cific Se­ries and also is the pri­mary spon­sor of the Melges 20 sail­boat. Fur­ther, Audi spon­sors the re­gional teams ERC In­gol­stadt (hockey) and FC In­gol­stadt 04 (soc­cer). In 2009, the year of Audi’s 100th an­niver­sary, the com­pany or­ga­nized the Audi Cup for the first time. Audi also spon­sor the New York Yan­kees as well. In Oc­to­ber 2010 they agreed to a three spon­sor­ship year-deal with Ever­ton. Audi also spon­sors the Eng­land PoloTeam and holds the Audi Polo Awards. In 2001, Audi pro­moted the new mul­ti­tronic con­tin­u­ously vari­able trans­mis­sion with tele­vi­sion com­mer­cials through­out Eu­rope, fea­tur­ing an im­per­son­ator of mu­si­cian and actor Elvis Pres­ley. A pro­to­typ­i­cal dash­board fig­ure – later named “Wackel-Elvis” (“Wob­ble Elvis” or “Wob­bly Elvis”) – ap­peared in the com­mer­cials to demon­strate the smooth ride in an Audi equipped with the mul­ti­tronic trans­mis­sion. The dash­board fig­ure was orig­i­nally in­tended for use in the com­mer­cials only, but after they aired the de­mand for Wackel-Elvis fans grew among fans and the fig­ure was mass-pro­duced in China and mar­keted by Audi in their fac­tory out­let store. As part of Audi’s at­tempt to pro­mote its Diesel tech­nol­ogy in 2009, the com­pany began Audi Mileage Marathon. The dri­ving tour fea­tured a fleet of 23 Audi TDI ve­hi­cles from 4 mod­els (Audi Q73.0 TDI, Audi Q5 3.0 TDI, Audi A4 3.0 TDI, Audi A3 Sport­back 2.0 TDI with S tronic trans­mis­sion) trav­el­ling across the Amer­i­can con­ti­nent from New York to Los An­ge­les, pass­ing major cities like Chicago, Dal­las and Las Vegas dur­ing the 13 daily stages, as well as nat­ural won­ders in­clud­ing the Rocky Moun­tains, Death Val­ley and the Grand Canyon. The next phase of tech­nol­ogy Audi is de­vel­op­ing is the e-tron elec­tric drive pow­er­train sys­tem. They have shown sev­eral con­cept cars as of March 2010, each with dif­fer­ent lev­els of size and per­for­mance. The orig­i­nal e-tron con­cept shown at the 2009 Frank­furt motor show is based on the plat­form of the R8 and has been sched­uled for lim­ited pro­duc­tion. Power is pro­vided by elec­tric mo­tors at all four wheels. The sec­ond con­cept was shown at the 2010 De­troit Motor Show. Power is pro­vided by two elec­tric mo­tors at the rear axle. This con­cept is also con­sid­ered to be the di­rec­tion for a fu­ture mid-en­gined gas-pow­ered 2-seat per­for­mance coupe. The Audi A1 e-tron con­cept, based on the Audi A1 pro­duc­tion model, is a hy­brid ve­hi­cle with a range ex­tend­ing Wankel ro­tary en­gine to pro­vide power after the ini­tial charge of the bat­tery is de­pleted. It is the only con­cept of the three to have range ex­tend­ing ca­pa­bil­ity. The car is pow­ered through the front wheels, al­ways using elec­tric power. It is all set to be dis­played at the Auto Expo 2012 in New Delhi, India, from 5 Jan­u­ary. Pow­ered by a 1.4 litre en­gine, and can cover a dis­tance up to 54 km s on a sin­gle charge. The e-tron was also shown in the 2013 block­buster film Iron Man 3 and was dri­ven by Tony Stark (Iron Man). In PlaySta­tion Home, the PlaySta­tion 3‘s on­line com­mu­nity-based ser­vice, Audi has sup­ported Home by re­leas­ing a ded­i­cated Home spacein the Eu­ro­pean ver­sion of Home. Audi is the first car­maker to de­velop a space for Home. On 17 De­cem­ber 2009, Audi re­leased the Audi Space as two spaces; the Audi Home Ter­mi­nal and the Audi Ver­ti­cal Run. The Audi Home Ter­mi­nal fea­tures an Audi TV chan­nel de­liv­er­ing video con­tent, an In­ter­net Browser fea­ture, and a view of a city. The Audi Ver­ti­cal Run is where users can ac­cess the mini-game Ver­ti­cal Run, a fu­tur­is­tic mini-game fea­tur­ing Audi’s e-tron con­cept. Play­ers col­lect en­ergy and race for the high­est pos­si­ble speeds and the fastest play­ers earn a place in the Audi apart­ments lo­cated in a large tower in the cen­tre of the Audi Space. In both the Home Ter­mi­nal and Ver­ti­cal Run spaces, there are tele­ports where users can tele­port back and forth be­tween the two spaces. 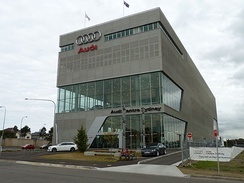 Audi has stated that ad­di­tional con­tent will be added in 2010.